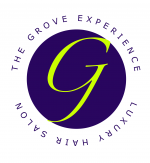 I’m Kimberly and I started at the grove experience in spring 2016. I originally began as a receptionist whilst completing my training, picking up from where I left off 8 years prior as an apprentice for a salon in Heathfield. I live in Hailsham with my husband, two children and dog, Rosie. When I first came to the salon I was a freelance occasional hair stylist, doing weddings, party and prom hair from home. I contacted the salon to further my skills and then continue to work from home, however when I started I very quickly realised the salon was very different to others I had been in and that this was somewhere I wanted to be part of. So here I still am, having finished my training and hit the salon floor in autumn 2017. My favourite aspects of hair are bridal and cutting. I am part of the bridal team here at the grove and feel very privileged to be part of someone’s special day, creating something unique and beautiful that completes their bridal look. I love the feeling a new cut/style can give someone. To be able to give someone confidence in themselves and their appearance is why I started hairdressing. I believe finding a stylist that listens and cares about your hair is so important and is something I strive to be. My second visit today with Kimberly. Up till now a perfectly competent person has come to my house to cut me hair, but OH things had got rather stale. I chose Grove cos it's so near me and I'm very glad I did. Friendly intelligent staff who do all they can for you from the moment you walk in until you leave. Your hair is not just washed.... you get to recline in a amazing MASSAGE chair while its done and a head massage is part of it. My stylist is a lovely lady who does what all ladies want - makes the most of what I have growing on my head! Everyone there clearly works as a team and the atmosphere is relaxed , happy and professional. I'm so impressed. Thank you.